Thousands of federal workers living in Florida are facing firsthand the pressure of missing their first paycheck as a result of the partial government shutdown. This standoff, coupled with the stress of not knowing when this crisis will end, has sent many folks running to their local financial institutions, desperate for assistance. Credit unions in the state are working diligently to aid their members and communities by providing assistance. Credit unions in heavily impacted areas have put together resources to help members stay fiscally afloat while waiting to go back to work. These offerings range from mortgage loan forbearance, waived fees for skip payments, expedited personal lines of credit and HELOC loans, consumer and credit card payment deferment, emergency short-term and no and low-interest loans, refinancing of auto loans with no payment for up to 90 days, and financial counseling on how best to navigate this incredibly difficult time. The League of Southeastern Credit Unions & Affiliates, which represents 134 credit unions and more than six million credit union members in the state of Florida, has compiled a summary page of how some of Florida’s credit unions are reaching out to serve members and their communities. In regions where there are fewer numbers impacted, credit unions are working on a case-by-case basis with their members to navigate through this distressing situation. Credit unions are the first to step up when there is a financial threat to their members. Though this is a difficult situation for so many, credit unions are ready to assist those being impacted. The League of Southeastern Credit Unions is proud to be a part of the movement that exemplifies the “People Helping People” philosophy. For all those affected by the shutdown, if you are a member of a credit union, make sure to reach out to your credit union. If you are not a member, now is the time to join the other six million Floridians who have made a credit union their financial institution of choice. Recently, federal workers experienced firsthand the pressure of missing their first paycheck because of the partial government shutdown. This standoff, coupled with the stress of not knowing when this crisis will end, has sent folks running to their local financial institutions. Credit unions throughout Florida are offering resources to help those impacted stay afloat during this emergency. These offerings vary from mortgage loan forbearance, waived fees for skip payments, emergency short-term and no- and low-interest loans, refinancing of auto loans, and financial counseling on how best to navigate this incredibly difficult time. The League of Southeastern Credit Unions has compiled a summary page at www.lscu.coop of how some of Florida’s credit unions are meeting needs. For credit union members affected by the shutdown, contact your credit union immediately. If you are not currently a credit union member, now is the time to join 6 million Floridians who have made this their financial institution of choice. News of credit unions assisting members continues to pour in as the government shutdown heads into its fourth week. The Hawaii Credit Union League reports that several member credit unions have rolled out assistance programs. The Credit Union Association of the Dakotas also reports that its member credit unions are providing assistance to affected government employees. The League of Southeastern Credit Unions is maintaining a web page of member credit unions that are offering assistance during the shutdown. 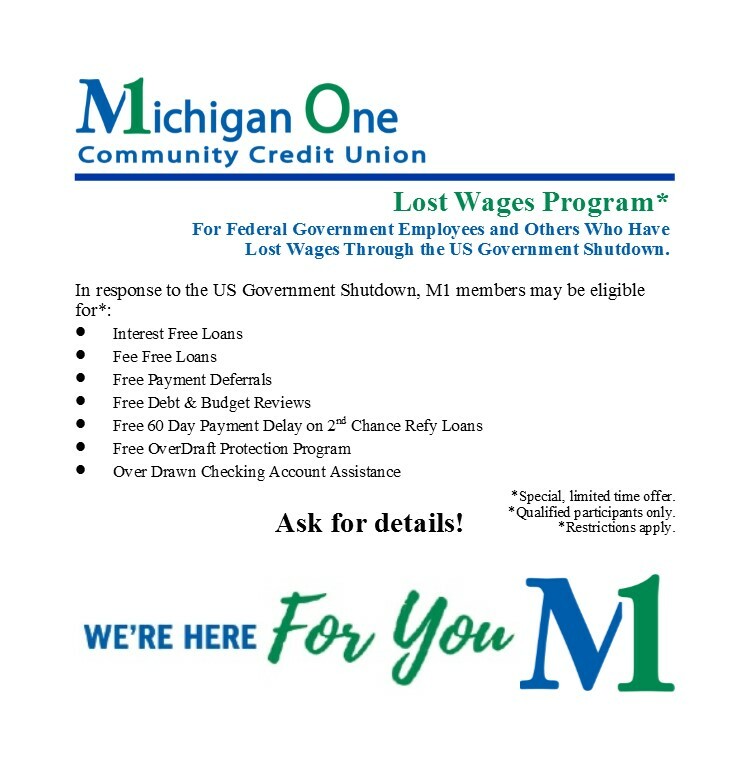 Michigan One Community Credit Union in Ionia offers a Lost Wages Program for members affected by the shutdown. Teachers Credit Union in South Bend, Ind., has announced a package of relief measures that includes a 90-day member assistance loan, loan payment deferments, delinquent loan solutions, and waiver of early certificate withdrawal penalties. Avadian Credit Union in Birmingham, Ala., offers a 0% loan for 60 days, plus an additional 30-day loan upon request if the shutdown continues. Town and Country Credit Union in Scarborough, Maine, offers several types of loans, with terms up to 12 months, to assist members. The credit union expects several dozen members to seek assistance once they miss their first paychecks. AmeriCU Credit Union in Rome, N.Y., offers interest-free furlough loans, fee refunds, and penalty-free certificate withdrawals. BIRMINGHAM, Ala. (WTVY) – Avadian Credit Union is offering furloughed federal government employees loans at 0 percent APR to help pay the bills during the federal government shutdown. Federal employees will be able to take advantage of 0 percent APR loans for 60 days plus an additional 30-day loan upon request if the shutdown is ongoing at that time. Employees affected by the government shutdown wanting to take advantage of this loan offer should stop by their local Avadian branch, visit avadiancu.com, or call 1.888.AVADIAN (1.888.282.3426).